The Fr33 Aid team had a great time at PorcFest 2012. 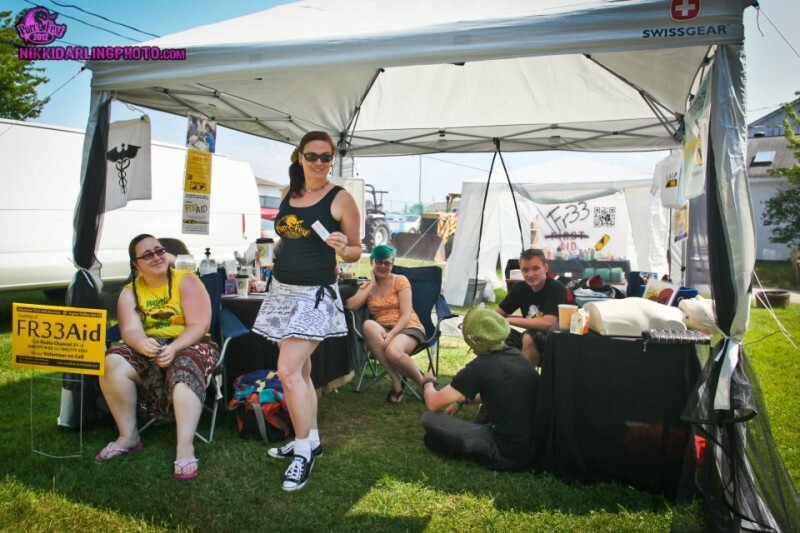 Leading up to the event, super PorcFest organizer Sharon Osborne agreed that we could keep the same, centrally-located site for our booth in Agora Valley as we had last year. This year was less stressful on the organizing side, as we have most of the equipment we need and our plans were already in place from last year. And many thanks to the American Red Cross of Sonoma and Mendocino Counties, we now have an additional CPR manikin, which allowed multiple people to practice CPR at once during our workshops. We were delighted to meet some new Fr33 Aid team members, including Katie, who is a midwife; Madeline, a nurse; Lauren, a former paramedic, and first aid providers Nikki, Vlad, Claire and John. It’s always fun to connect with medically skilled liberty lovers, and it’s very encouraging that our team continues to grow. Many people came by our booth for help with cuts, scrapes, blisters, bug bites and sunscreen requests that are typical during a summer camping event. In addition, our volunteers helped with two other medical issues that were more serious. One person collapsed while dancing and required transport to the nearby medical center. She requested to be transported by private vehicle, and another participant stepped up to drive her. Jacob, a volunteer EMT with Fr33 Aid, accompanied her there. She was released the next day and came by Fr33 Aid to check in and say thanks. Later the same day, another PorcFest participant suffered an allergic reaction and collapsed while trying to reach the Fr33 Aid tent. Jacob was right there again, along with Tom, who is also an EMT and Fr33 Aid volunteer. They evaluated the patient and provided support and oxygen. Because of the dangerous possibility of a closed airway and need for more advanced care, we called for an ambulance while Jacob and Tom continued to attend to the patient. Fortunately, the ambulance crew showed up without any cops. Meanwhile, another bystander talked with the food vendor where the patient had eaten to determine their ingredients and report back to the patient and our volunteers. I witnessed the interactions between Jacob and the ambulance crew while the patient was being transferred to the ambulance. Jacob clearly and calmly described what had happened, as well as the allergy medication the patient had taken and what he and Tom had done to care for the patient. The EMS service provider’s response was to lecture Jacob about how he’s not allowed to give out medications as only an EMT-Basic. I was surprised and angry to hear this, especially since there are so many more important things to focus on when a person is having a serious allergic reaction. But I bit my tongue while Jacob patiently explained that the allergy medication was an over-the-counter one that the patient had taken himself, and he also clarified that he’s an EMT-Intermediate. The EMS service provider persisted that EMT-Basics aren’t allowed to give medications and the paperwork would need to be updated to reflect that Jacob’s certification is as an Intermediate. Jacob patiently reiterated that the patient had taken the allergy medication on his own, and shortly afterward the ambulance crew left. The next day we heard the patient was released after a period of observation at the medical center and was back enjoying PorcFest. The food vendor came by the Fr33 Aid tent that day to check on the patient’s status and find out if there was any more information about what had caused the reaction. I thanked her for coming by and told her that although we didn’t have more information about the cause in this case, we’re thinking of developing a template for signage next year to disclose foods and ingredients that are common allergens. Like last year, our team administered dozens of CPR quizzes and demonstrated our AED for people who stopped by our booth. We were happy our voluntary heart pins continued to be a big hit. In addition, Jacob and I offered daily CPR-AED workshops to interested participants. We covered the basics of CPR: why it’s needed, what it does, how to do it, and we offered people a chance to practice on our manikins. Then we provided a demonstration of the automated external defibrillator (AED) which gave participants an opportunity to hear how the device talks them through what to do during a cardiac arrest. We had several participants in our workshops most days. We’re grateful there are many people in our community who are interested in learning how to help others in the event of a cardiac arrest. This year we received a glasses hat from James Ray to include in a raffle, and hundreds of people entered their cards to win it. During the PorcFest group photo, Chris Lawless performed the raffle for us and selected the card for Ryan Walsh as the winner of the hat. Afterward, Chris liked the hat so much he didn’t want to give it up. 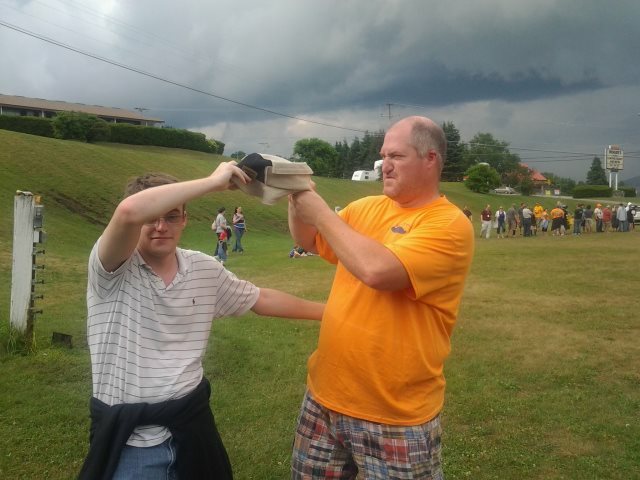 Fortunately, we have it on good authority that Ryan enjoys wearing his new hat… thanks for parting with it, Chris! Fr33 Aid continues to be 100% staffed by volunteers, and all of our equipment and expenses are paid for through voluntary donations. We had expected that fundraising this year would be less than last year since people knew we had already covered our startup expenses with donations at last year’s PorcFest. I’m delighted to say we exceeded donations from the prior year, raising over $1000 plus various miscellaneous alternative donations. 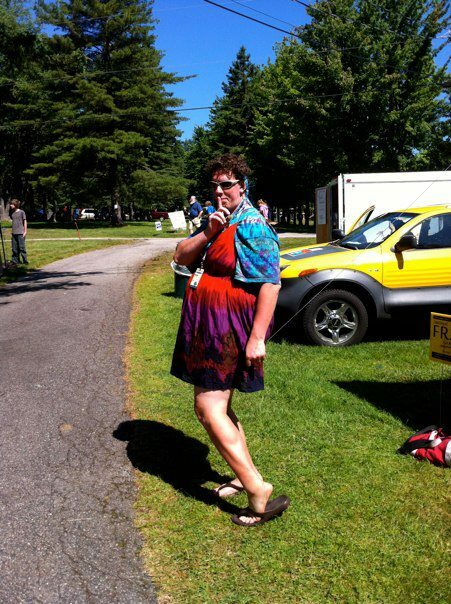 We achieved the goal Darryl Perry had set for wearing a dress on the last day of PorcFest. We appreciate his support and enjoyed hanging out with him at our booth that day. Doesn’t he look pretty? After reimbursing our volunteers who had used their own medical supplies or paid for pharmacy items and sweatshirts, we cleared over $600. This money will be used for ongoing administrative expenses, providing additional classes and programs, and to help our team travel to other events. 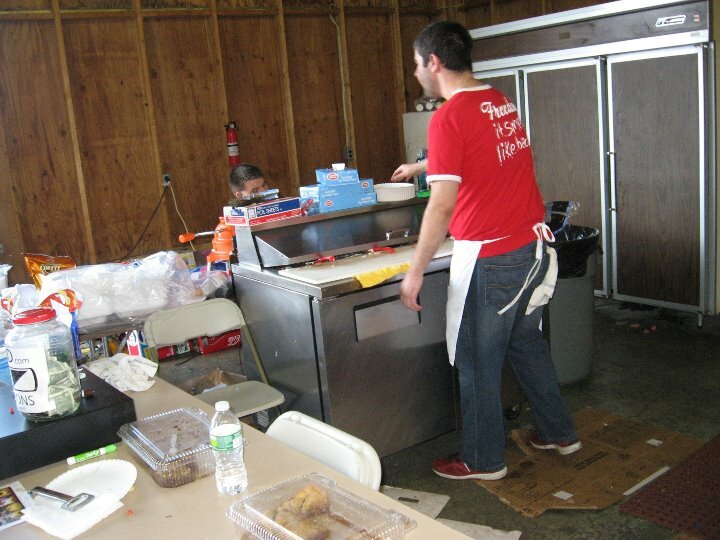 We greatly appreciate the support we received from PorcFest attendees, the organizers Sharon and Jason Osborne and especially Mandrik, Luthor and Jay from George’s Famous Baklava, who raised almost $400 for us with the jar on their counter in the pavilion. The jar was placed conspicuously near the place where you would often see tip jars in other establishments. We love these guys! 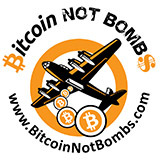 We are very happy we received a wide variety of alternative currencies and other types of donations this year. 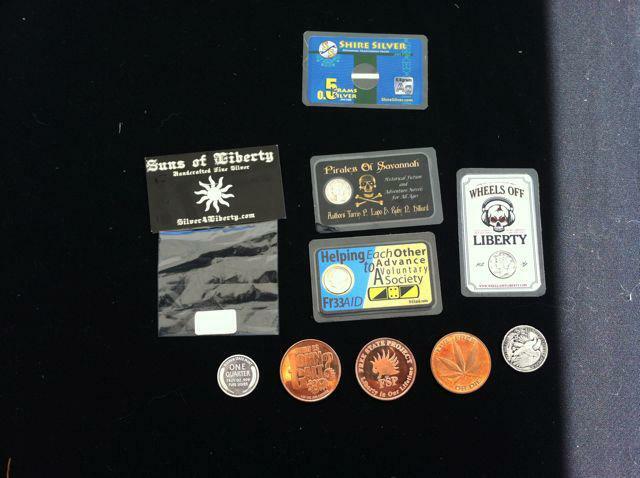 In addition to these donations, we were delighted to see the new Fr33 Aid dime cards in person, thanks to our friends Drew and Ross at DontTreadOnMeme.com. A sample is shown in the center of the photo above. We plan to make these available more widely soon – stay tuned! 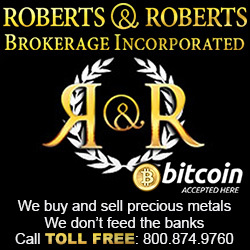 We had a great time at PorcFest this year and we’re in process of determining who from our team can attend Libertopia. Keep an eye on our blog for future updates about our plans!